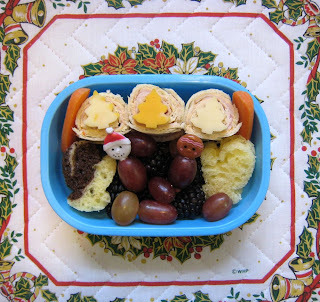 BentoLunch.net - What's for lunch at our house: More Canadian Christmas Bentos! Faith is a bit under the weather right now, so the only one having bentos right now is Ben. I suppose I could stick chicken broth in a bento for her, but that just seems silly. And messy. Mostly messy. We did bring a few of our own containers and food picks to Nana's house to make bentos in, but we're enjoying all her cool cookie cutters and decorations. Today, Mr. Ben has turkey tortilla roll-ups with roasted red pepper cream cheese, topped with marble cheddar Christmas trees (the cutter is from a Linzer cookie set, too cute!). To go with that, he has a couple of pieces of pound cake, shaped like mittens for the winter, of course, some carrot sticks, blackberries and grapes. We just made about 30 dozen cookies last night, so there should be some yummy, cookie-filled bentos very soon! Don't forget, our $200 Visa gift card giveaway from BlogHer/Chef Boyardee is here! And a $100 Visa gift card giveaway from BlogHer/Pop-Tarts is on the review blog--our gingerbread brownie recipe or Faith's very cute video post have the entry form. Very cute! I hope Faith feels better soon, bad timing to not feel well! What a great idea! Can't wait to see the cookie boxes!